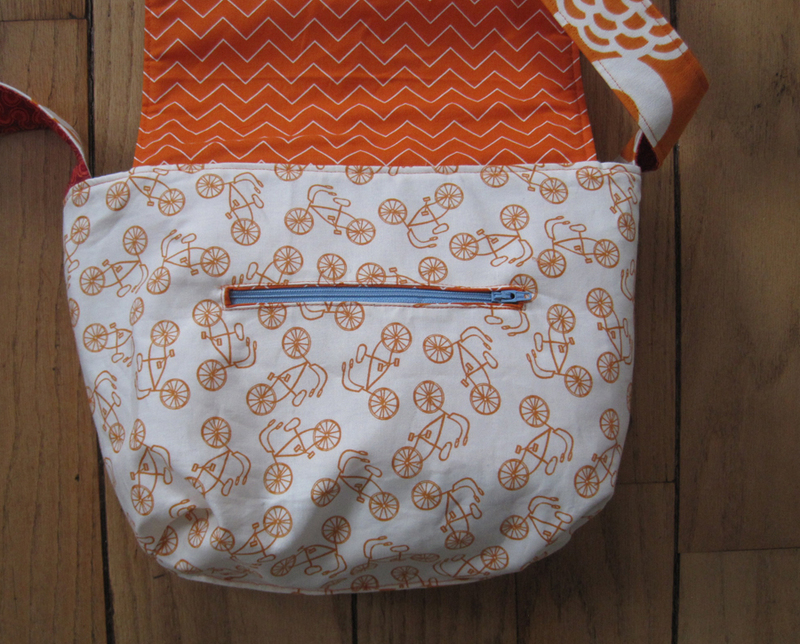 Ever since I first used By Annie’s Soft and Stable in my kiss clasp purse, I’ve been wanting to try it with my favorite messenger bag pattern. 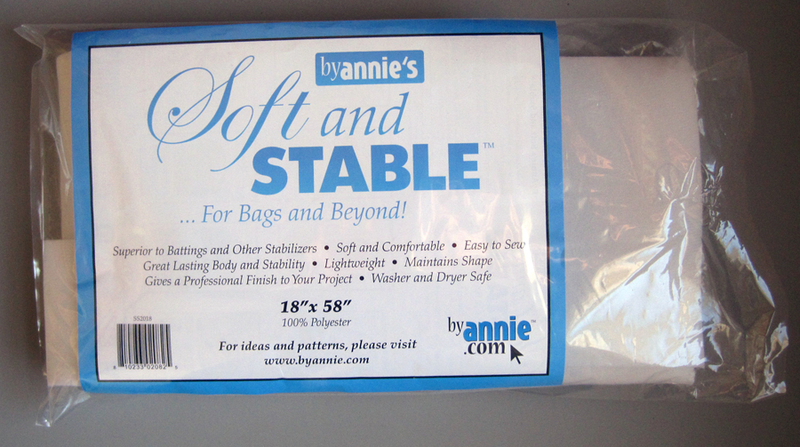 The Soft and Stable gives body and structure to bags that you just don’t get with interfacing and batting. After regular use, my kiss clasp purse still sits up by itself (although the fabric is getting to be a little worse for wear). 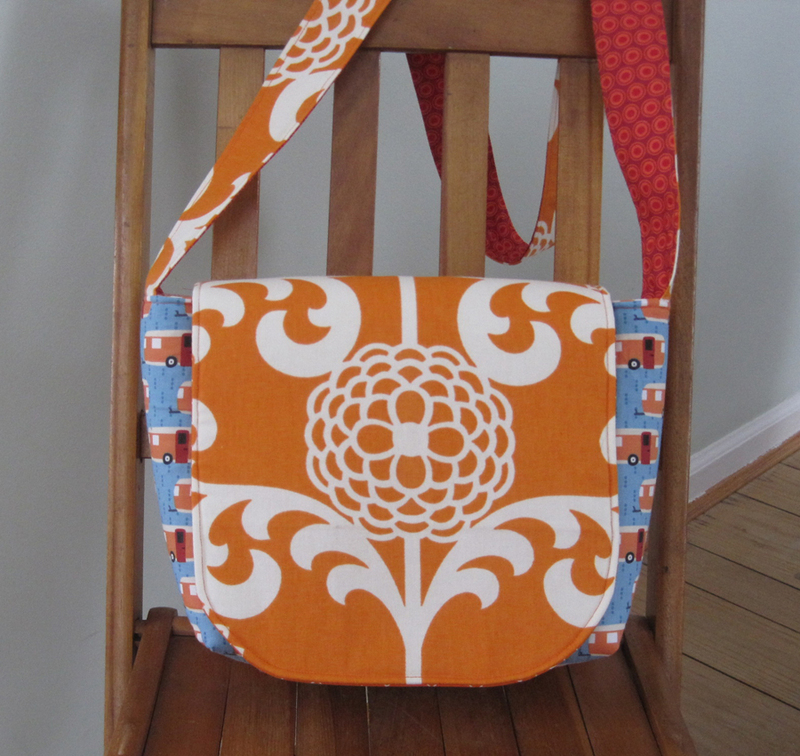 The messenger bag pattern is one I made last year in blue and orange. So this time I decided to not only make it with the Soft and Stable but to mix up the palette, going with orange and blue. 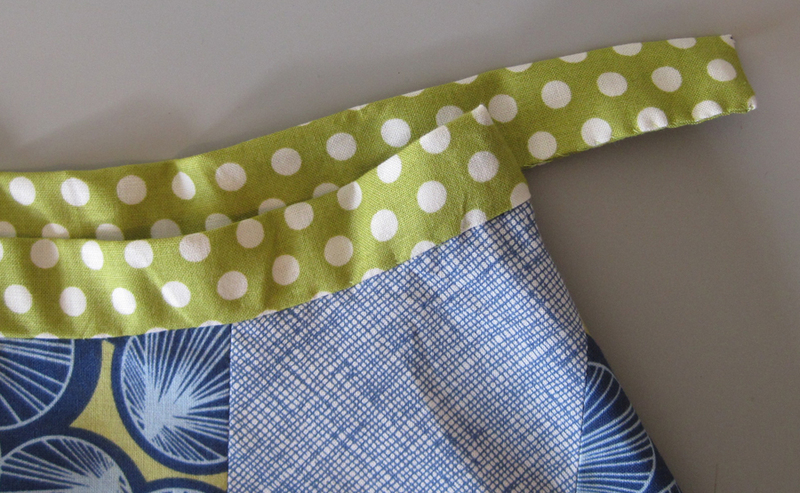 The pattern I used for the kiss clasp purse suggested that you use a zigzag stitch to sew the Soft and Stable to your cut pattern pieces. Here’s my messenger bag flap stitched and ready to go. 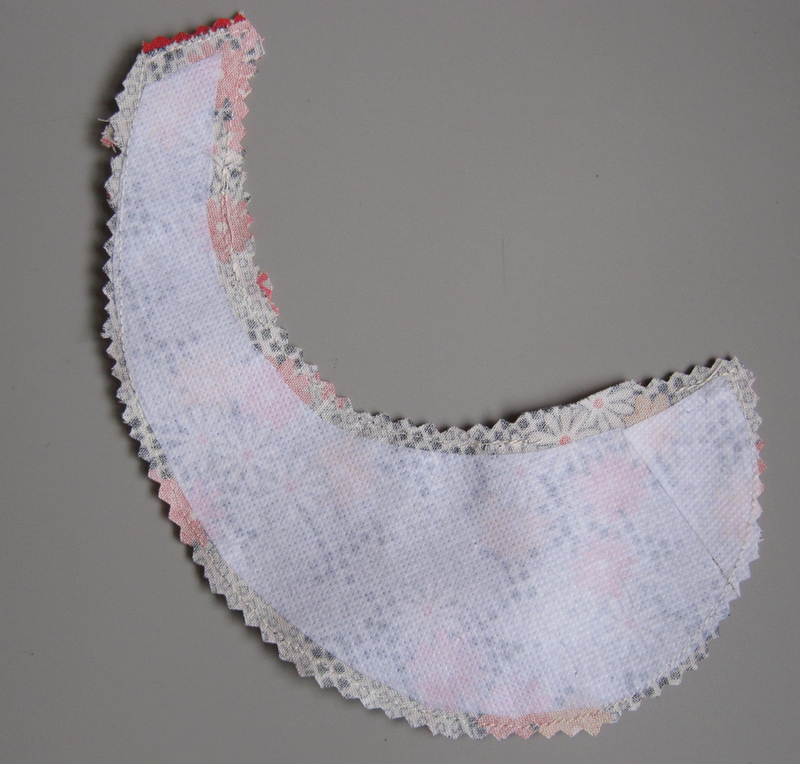 The instructions for the kiss clasp purse called for cutting squares from the corners of the fabric for the boxed bottom, rather than trying to match the seams and then trimming off the corners. I found the square method so much easier, so I applied it to this bag as well. 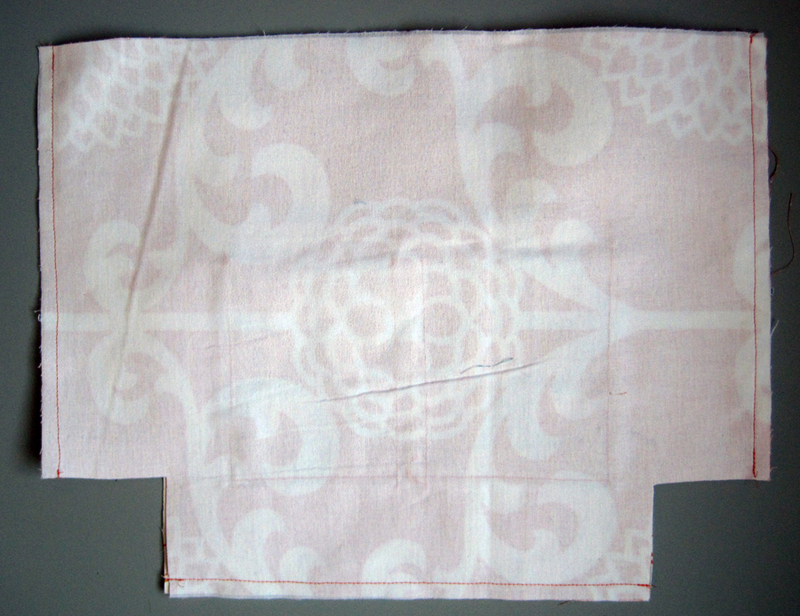 I layered my lining pieces, right sides together, cut squares from the bottom corners, then stitched the sides and bottom. I repeated this with the exterior pieces. With the corners removed, you can easily match up the side and bottom seams to finish the bottom. As usual, I added all the pockets I like to have. 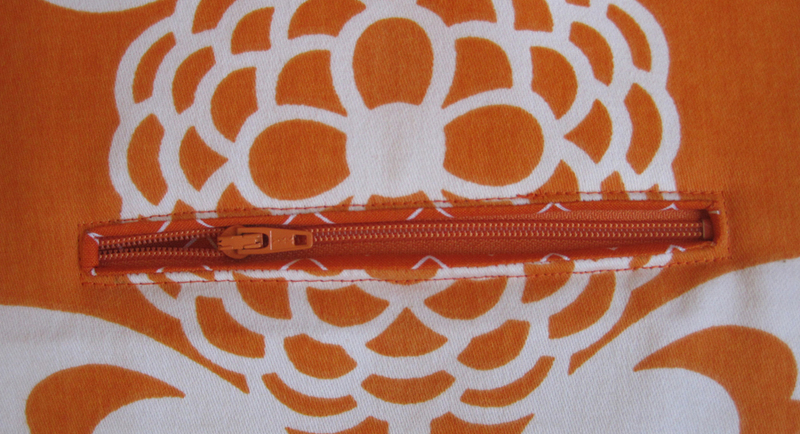 The interior includes a zipper pocket and a simple flat pocket. As always, I turned to The Bag Making Bible by Lisa Lam for reminders of best practices when it comes to pockets. 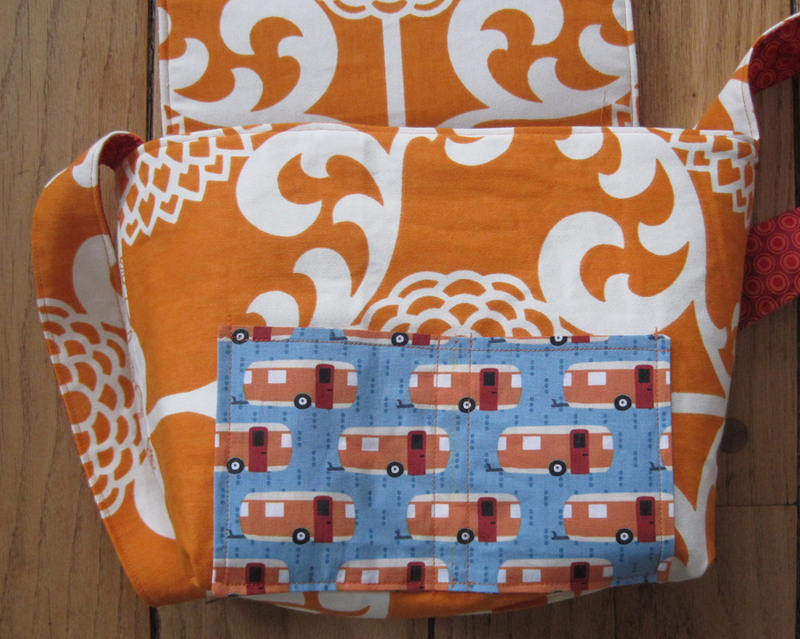 I also added a zipper pocket on the exterior. I was a little nervous about this because I would be cutting through the Soft and Stable, which just seemed really thick. In my first attempt (above), my zipper had a fat lower lip. I didn’t get close enough to the fabric edge, so too much of the Soft and Stable pooched out. But I tried again, and I was happy with the result. The bag does have great body—I love that it can sit up by itself. The added structure makes the gaps at the sides of the flap a bit more pronounced, but if it’s not tipping over, then the contents should stay put. 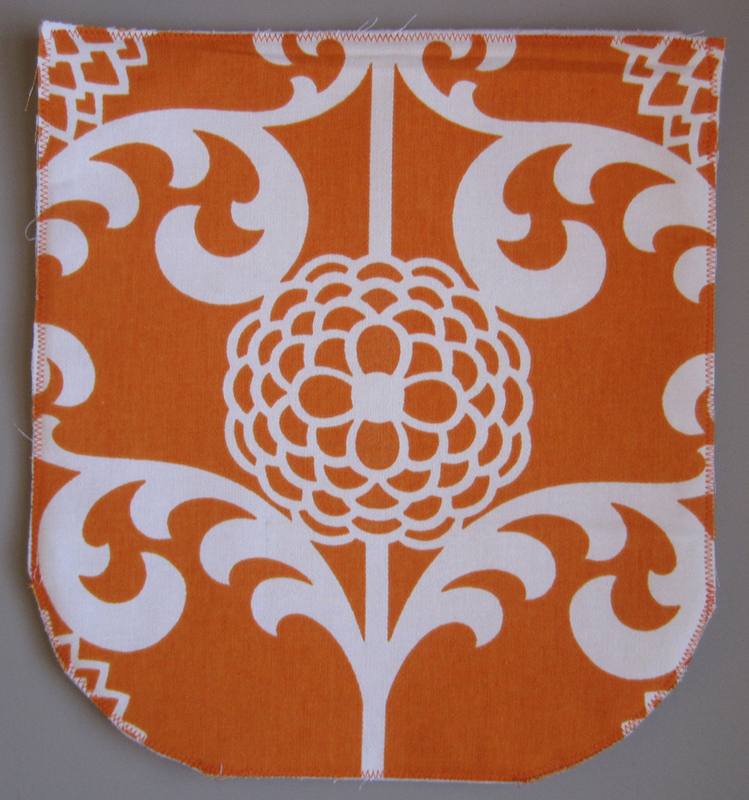 About the fabrics: The orange and white piece is a home decor fabric remnant that I picked up at Creativities, an art studio just a few blocks from my house. 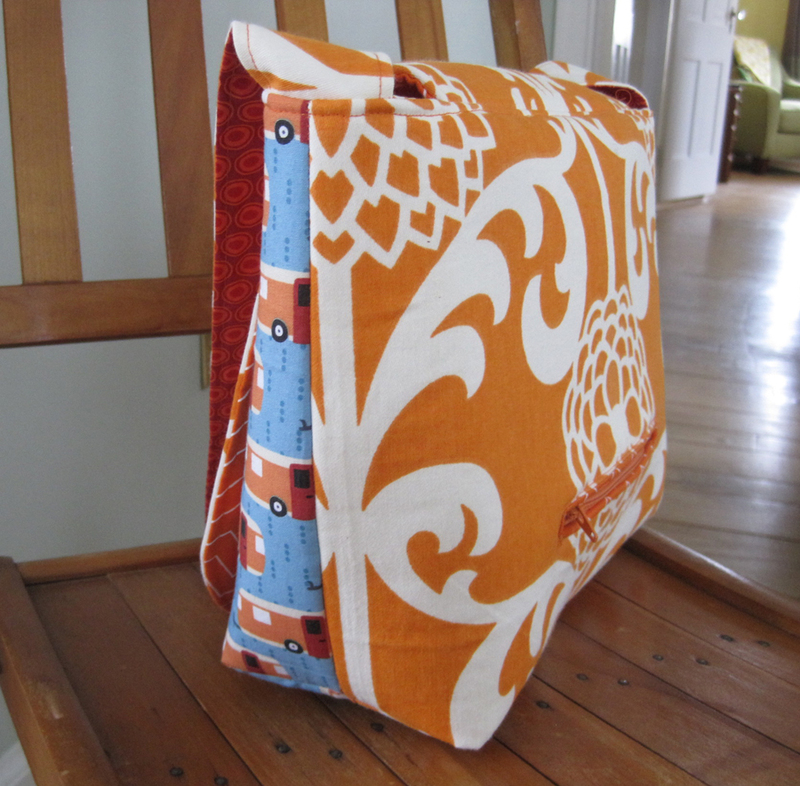 The rest of the fabrics are from my orange stash. 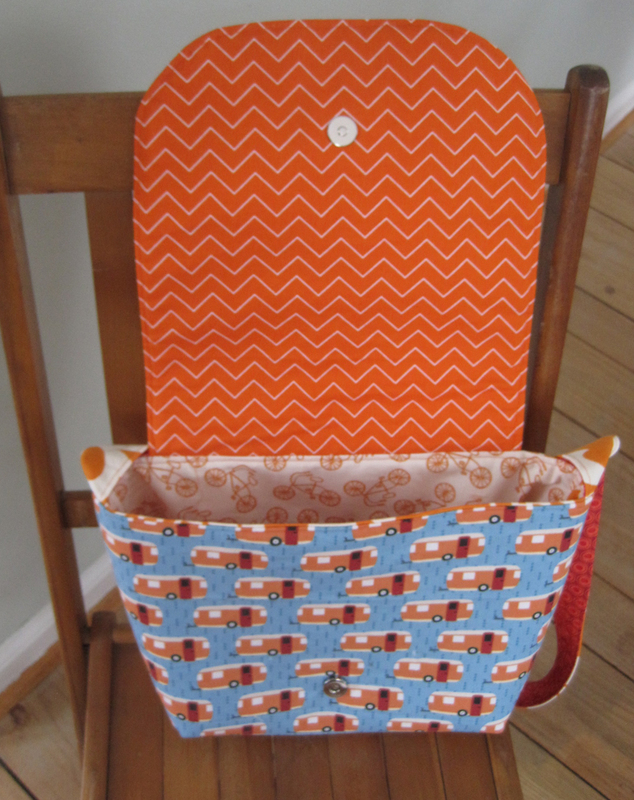 I kind of liked the idea of a travel theme for this bag, since I think it will be great for trips of all sorts. 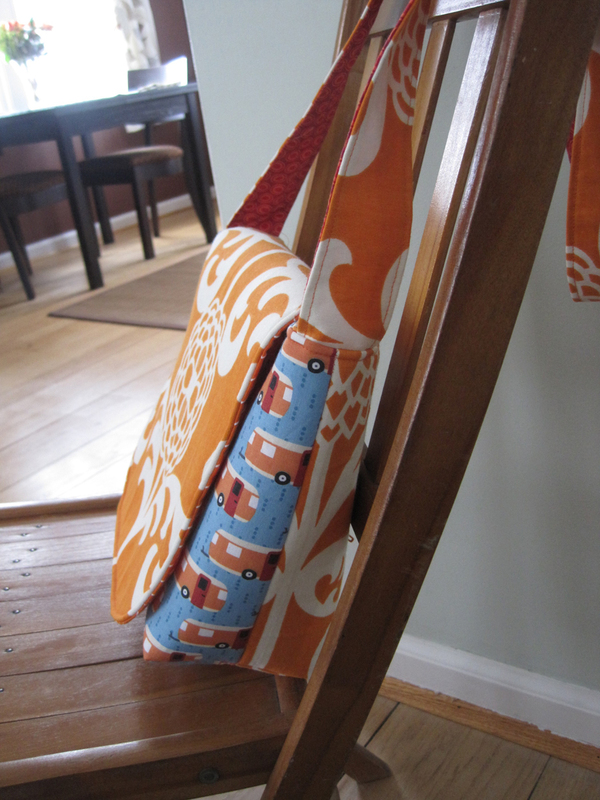 So I was glad I had some camper and bicycle fabrics to use. Overall, I’m very happy with the bag. I’ll be taking it on our upcoming beach trip, so I’ll see what it’s like to use. But for now, I plan to use Soft and Stable in all my bags. Greg and I will be spending a week on the beach this winter, and whenever we do that, I feel the need to make a skirt for the trip. So this past weekend, I got started on it. 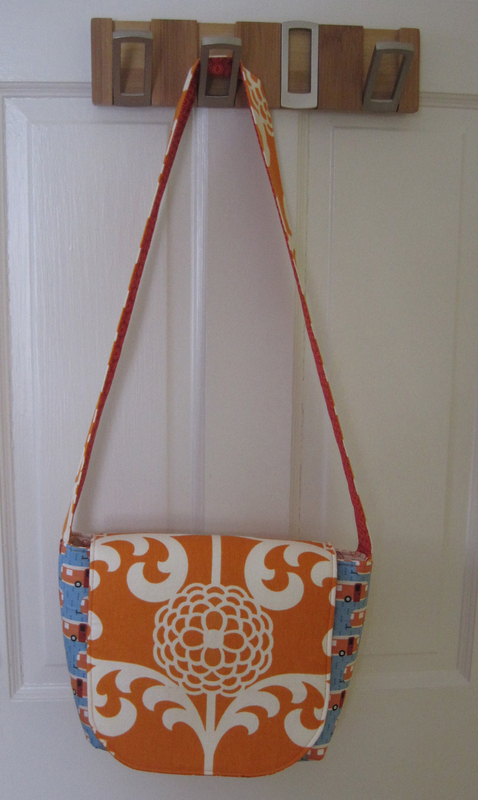 The pattern I used came from the book Gertie Sews Vintage Casual by Gretchen Hirsch, which Greg gave me for Christmas. The skirt I made is the one on the cover. As usual, I threw myself headlong into the project with only a vague idea of how I was going to proceed. I really need to stop doing that. Especially when sewing clothing. I cut out the two halves of the skirt, guessing at my size rather than looking at the sizing chart. 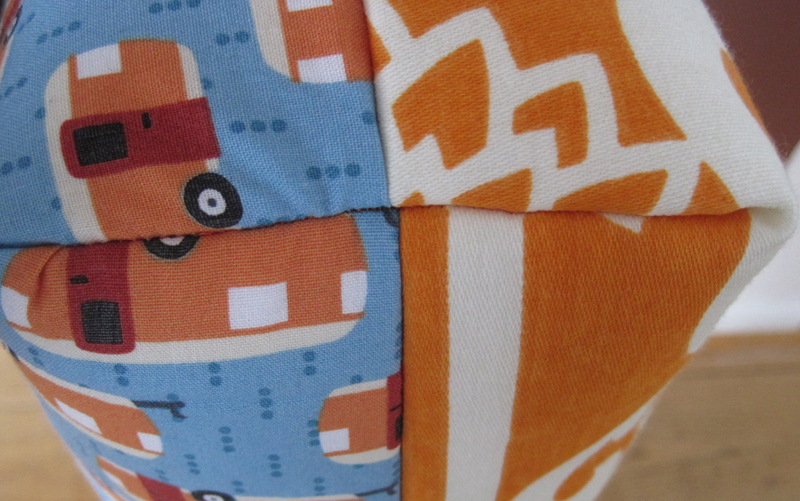 Then I decided to add a patchwork panel in the front, just for fun. I had seen something like that in a magazine, but I didn’t know if they placed the panel on the grain of the fabric or at the same angle as the flare of the skirt. With a skirt this flared, it would make a big difference. But rather than dig out the magazine, I put the panel on the grain (which seemed more stable than sewing it on the bias of the flare). 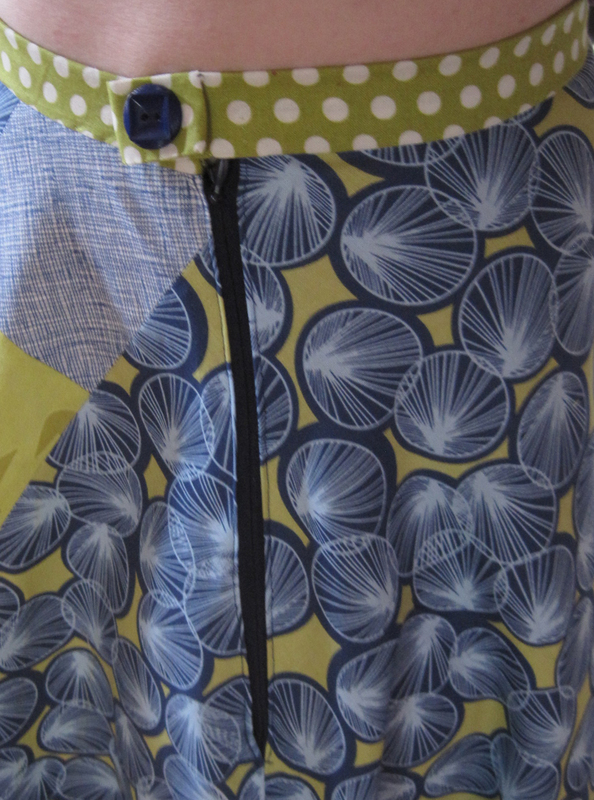 Before sewing in the lapped zipper, I tried on the skirt and could tell it was too big at the waist. So I took a little from each side seam. 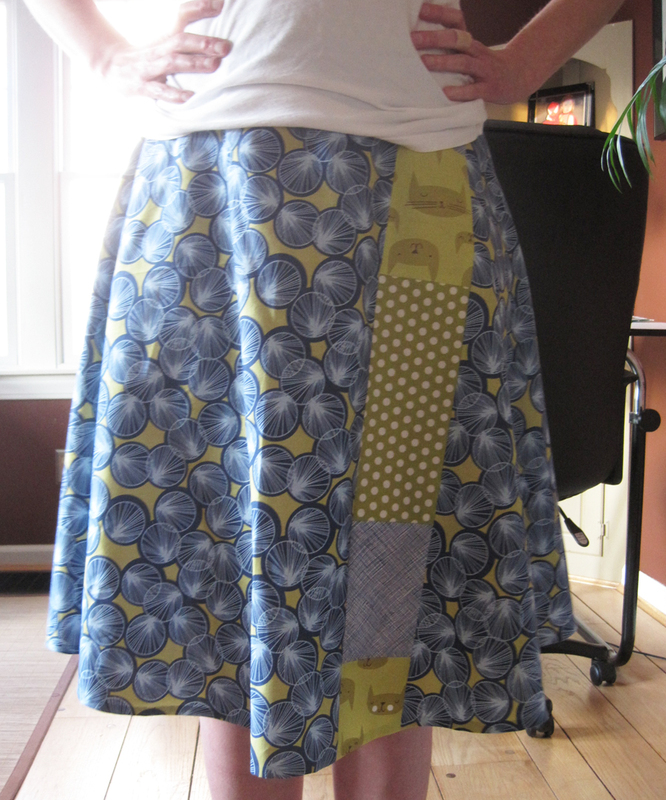 Then I sewed in the zipper (which ended up being a bit crooked) and tried on the skirt again. I could pinch a two-inch section of excess fabric from the waist. I must have cut out the wrong size. 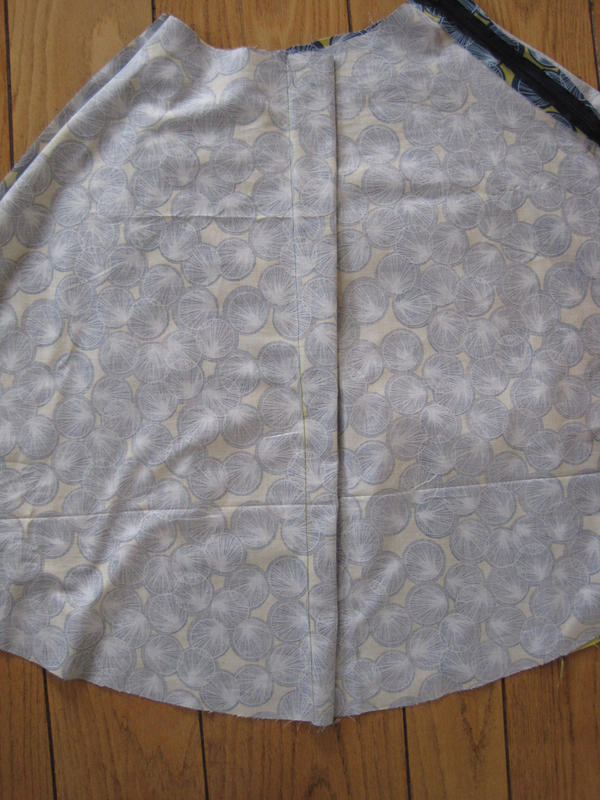 First I just sewed a giant dart in the back of the skirt to eliminate the excess fabric. 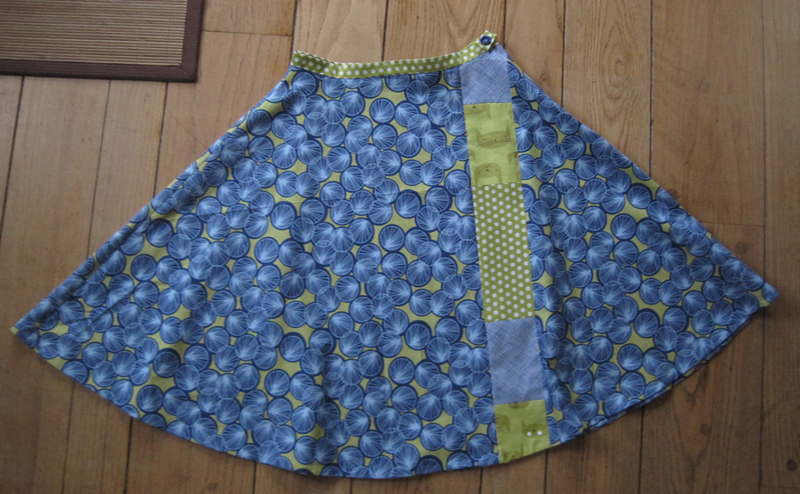 But that moved the side seams (and zipper) to off my sides and onto more of the back of the skirt. So I took that seam out and took in the waist the right way—at the seam. Next came the waistband. The pattern called for a lapped waistband, which seemed easy enough. Except I realized after it was sewn on that the longer end was wrapping toward the front of the skirt rather than toward the back. My first solution was to place a snap on the waistband as the closure. Then I accordion folded the excess fabric and sewed a decorative button on top, which served to secure the folded lapped fabric and hide the stitches of the snap. However, when I tried the skirt on again to take another photo of it, the button came flying off. So that wasn’t going to work. Again, I decided to do it right and make the button the closure and cut off the excess lapped fabric. My waistband was a little too narrow for the size buttonhole I needed, so I really have to force the button through the hole. While I was at it, I top stitched the waistband. Because while I don’t always have a solid plan or read the instructions thoroughly, I do insist on top stitching everything. 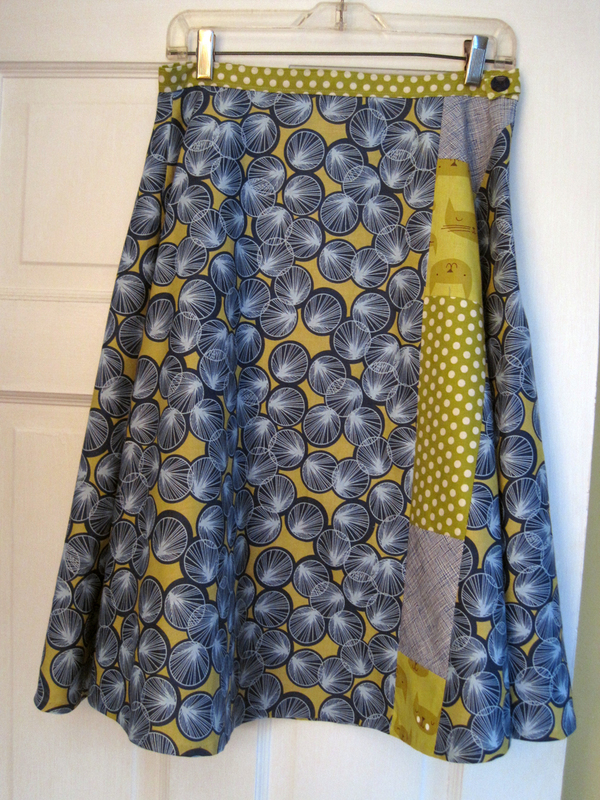 So here’s the finished skirt. It fits well. The patchwork panel is a little odd. The angle, as I said, is with the grain of the fabric, but it is still a bit jarring. And I have to say, I didn’t intend this to be a cat skirt. I wanted a skirt with a patchwork section, and one of the fabrics I chose for that section was cat fabric, because it matched. But I pretty much have a cat skirt now. The book had all the information I needed for making the skirt, and all the information made sense. 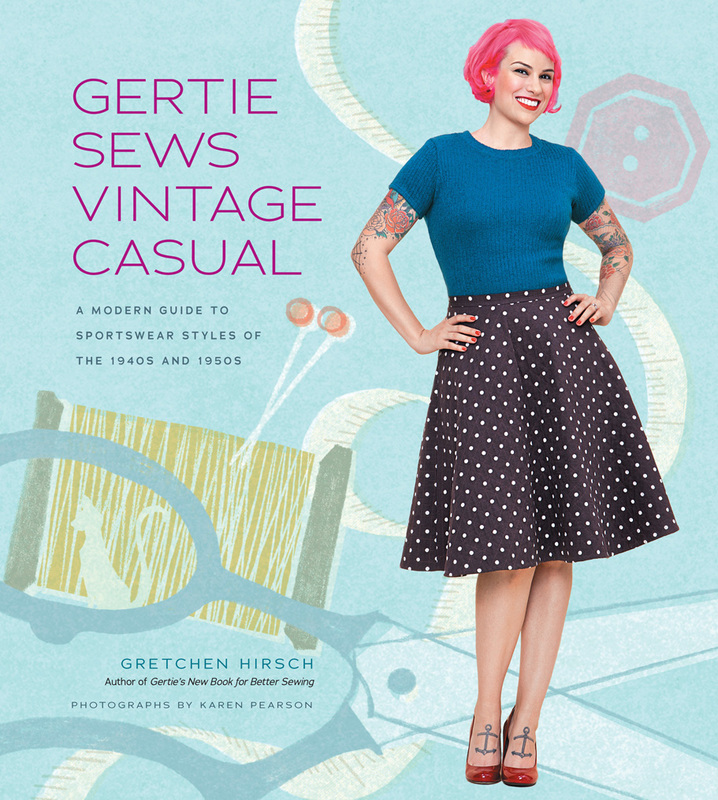 To make the skirt, though, I needed to do a lot of flipping around the book—to the zipper section, the waistband section, the hemming section. In this case, I sometimes chose to guess rather than flip, and that’s completely my fault. Next time I need to do what the instructions always say to do: Read through the whole pattern first, flipping to all necessary sections, and then start. After three years as a freelancer working from home, I can say with confidence that I have no idea what is fashionable. Knowing what’s on trend is for people who see other people every day and/or who buy clothes. I find I don’t do either with much regularity. 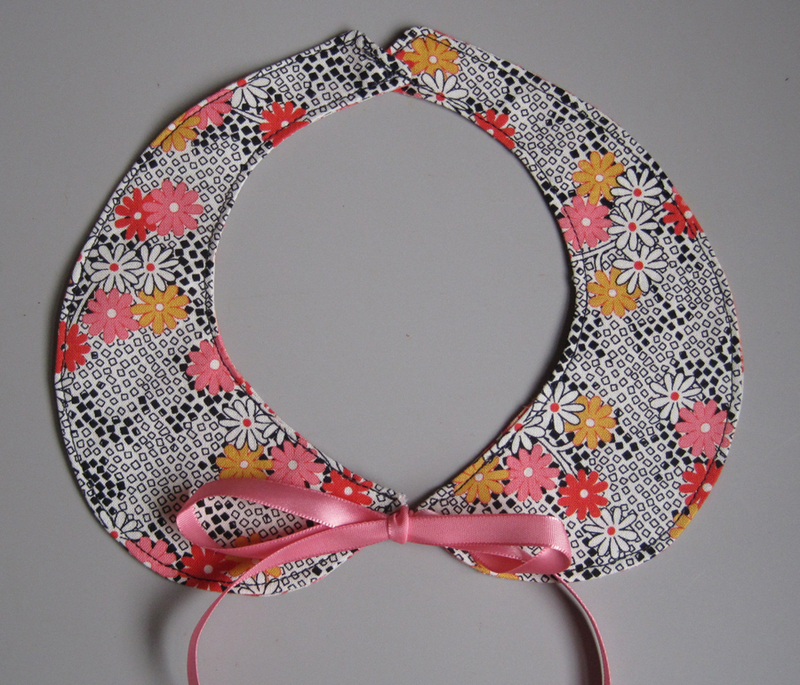 So I was a bit surprised when my sister Jenny suggested I make a detachable Peter Pan collar for Stella’s seventh birthday. 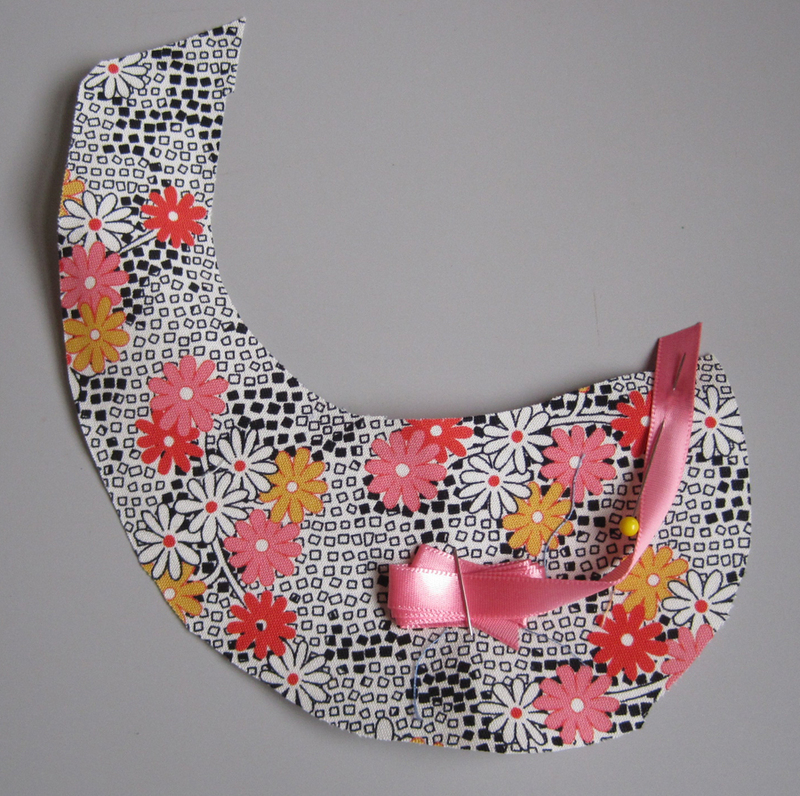 It turns out these collars have been a thing for a few years now, and Jenny noticed that Stella comments each time she sees one in a catalog or magazine. I searched for patterns online and finally found some that were sized for children. I really liked the shape of this collar from My Sparkle. It was just what I had in mind except I wanted the tie to be in front rather than the back, and after seeing some other collars, I wanted it to be reversible. The construction method in the pattern wasn’t going to work for the reversible aspect (the pattern called for slitting the collar lining to turn it inside out), so I figured out my own steps. 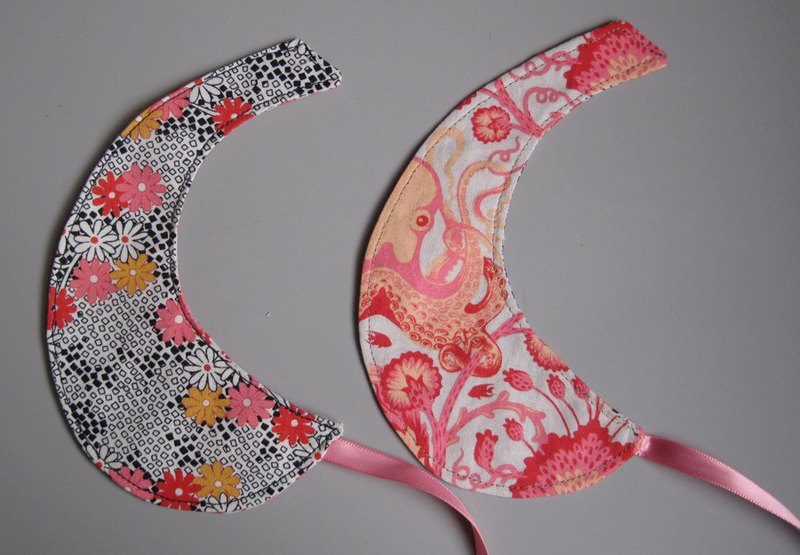 I cut the pattern from two different fabrics and from a medium-weight fusible interfacing. 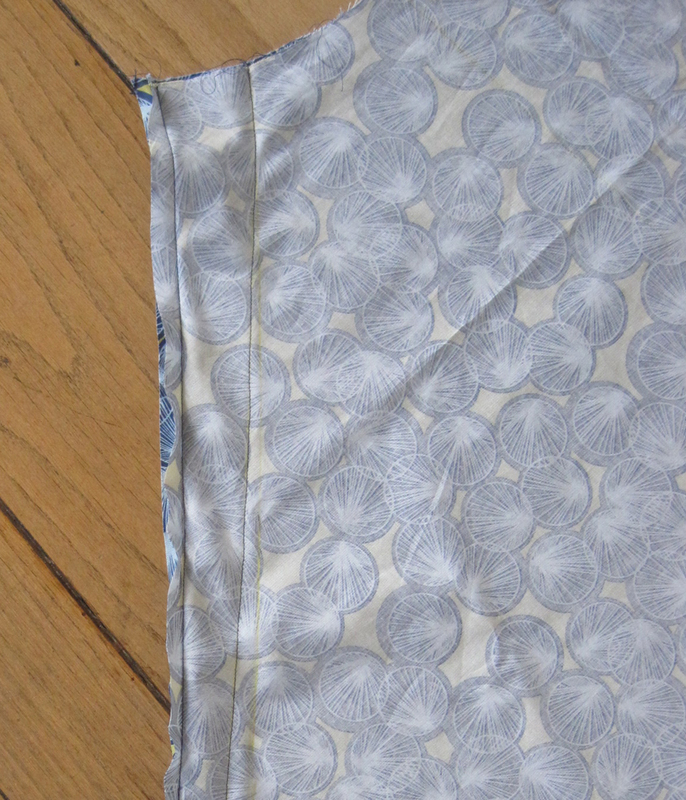 I fused the interfacing to the front fabric pieces. I then cut my ribbon ties to several inches long and pinned them to the top of the front collar fabric. 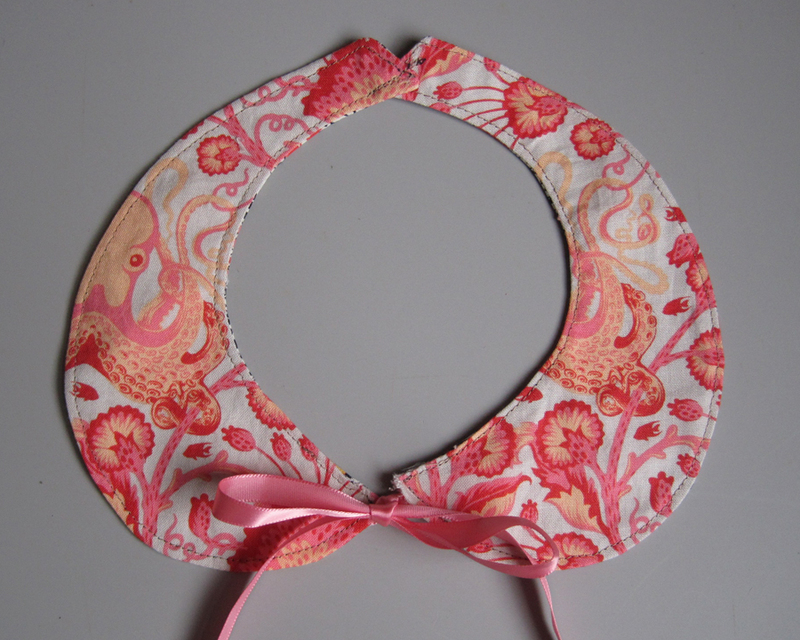 I would be sewing pretty much all the way around the collar shape, and I didn’t want to catch the loose ribbon end in the stitches, so I secured it to the center of the collar with a pin. I placed the back piece of fabric right sides together over the front and sewed around the edges, leaving a few inches open for turning. Then I trimmed all the seam allowances with pinking shears. I turned the pieces right side out, pressed the edges flat, and top-stitched around the edges, closing the turning hole in the process. Then I realized I’d made a mistake. Gah! I pinned one of the ribbons to the wrong edge of the collar. Since the whole thing was sewn together already, I got lazy, and just picked out the stitches in that corner. By the time I got the stitches out, the fabric in that area was a bit worse for wear, but I moved the ribbon and closed up the seam as best I could. Now the ribbons were in the right place. 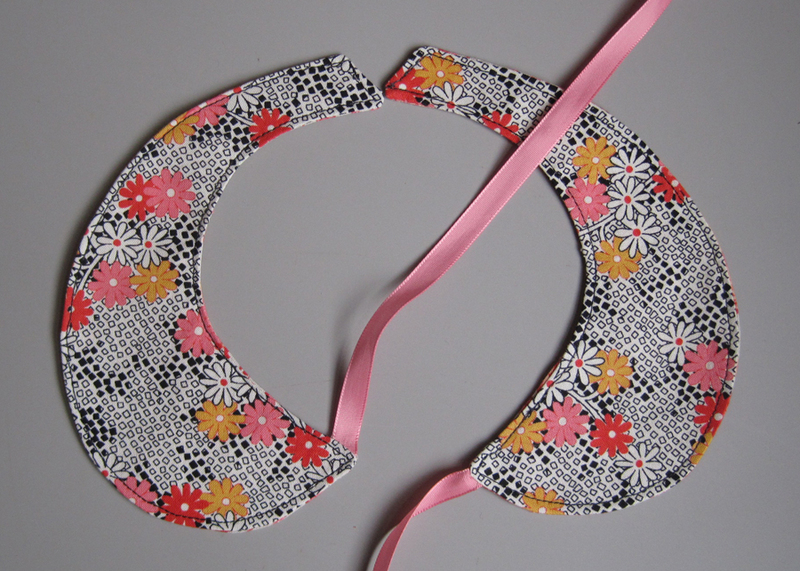 The pattern called for hand stitching the two collar halves together, but I machine sewed the back edges instead. Here’s the front and the back. I hope Stella likes at least one side of the collar and wears it a few times. I don’t know that it will hold interest to her (or hold up) much longer than that. But that’s fine considering how quick and easy the project was to make. Then I’ll just make her whatever she tells me is in fashion next.